It was my brother, Gordy, who first introduced me to Jim Gaffigan's comedy sketches. I think the first one I watched was his ode to bacon. I laughed. A lot. What I wasn't planning on was how easily I'd get pulled into the book every time I went into the room to check on Mike's progress. (Okay, I'm a liar. Mike didn't need any supervision. But after I got so bogged down in so many half-finished books, I told myself I could not start anything else until I'd caught up with myself. Hence, the excuses to check on the painting status so I could sneak a listen here and there.) It was easy to just jump in and enjoy any of the essays in any order. Finally though, I finished the other audiobooks I was in the middle of, and I got to enjoy the entire book from start to finish. Jim Gaffigan and his wife, Jeannie, are the parents of five children. Dad is Fat (the title of which is taken from the first complete sentence written by one of his sons) is a collection of essays, all with the general theme of parenthood. He talks about everything from the nightmare that is taking your children out to eat to the impossibility of quickly leaving the house to comparing dogs to children. Some of the essays are taken from his stand-up routines, but most of it was new to me. Having come from a large family (the oldest of eight kids), and on the brink of having four children myself, I found this book absolutely hilarious; I could identify or relate to it in so many ways. One of my favorite essays was about how noisy children are. Gaffigan said, "We make efforts to stop our children from making noise, but it's like trying to stop the sun from coming up." I seriously wish I could go back in time and hand a copy of that essay to our former neighbors (their bedroom wall backed up against our living room wall). They were never mean, but they definitely didn't understand how impossible it was to try and keep three young boys quiet before 8:00 in the morning. It took me almost a month of living in our own home before I stopped automatically shushing my kids when they woke up each morning. Jim Gaffigan houses his family of seven in a two-bedroom apartment in New York City, which makes our current home feel practically palatial in comparison (and makes me feel indescribably grateful). "If you ever take your kids to a situation where they must be quiet, bring lollipops. They're like flavored muzzles. Mothers-to-be should be given bouquets of lollipops at baby showers. At the hospital, people should hand lollipops to new fathers and say, 'Here, you're going to need this.' It's the parents' secret weapon." "The Black Hills of South Dakota are breathtaking. They are sacred to the Lakota Indians, and out of respect, our government has carved four white guys into one of the mountains. 'These hills are sacred to us.' Carver: 'Yeah, yeah, yeah. We'll be done in a couple of decades. These guys I'm carving were all about freedom, especially the two who owned slaves. Just consider it a gift from us white people, a reminder of all the good things we've done for you.'" "Because of our cell phone cameras, we have way more photos than we will ever need. What are we supposed to do with all these photos of our kids? Yes, there is the benefit of our computers running really slow, clogged with thousands of photos of the same pose. But outside of that, it's pointless. Yet we keep taking pictures. Click, click, click, click. We download all of them. We don't even weed out the bad ones. 'Aw, I'll just get another computer. This will be my Disney trip computer.'" Even though Jim Gaffigan's humor is usually considered clean (or as he laments, "family friendly"), it is peppered with some mild language and some mildly crude humor, so just be forewarned. Also, I will say that I didn't find him funny all the time. There were passages like this one, "Why don't we eat something? Then we'll go get something to eat. Then we should see that thing we're supposed to see. They've probably got a snack bar there so we can get something to eat. But after that, we've definitely got to go get something to eat," that just seemed a bit dumb and juvenile. But underneath all the humor and sarcasm and dry wit, there was a surprising streak of sentimentality and seriousness. For all of his making fun of his family, Jim Gaffigan loves his kids, and he loves having five of them. I loved the way he defended the family (and defended big families at that). This is a side of him that I don't think gets showcased in his routines too often, but it was so touching to hear him talk about his transition from not really wanting any kids to renting a tour bus in the summer so he won't have to spend weeks away from them. So listen to it (yes, listen . 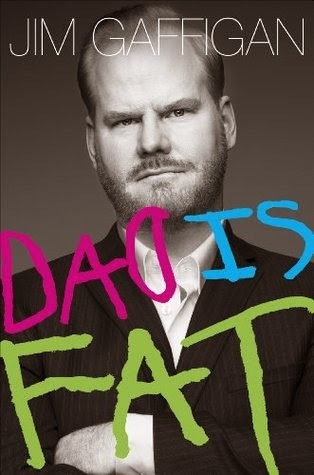 . . why would you want to read it if you could hear Jim Gaffigan narrate it himself?). Listen to it because it's funny. But also listen to it because it will make you love your family just a little more (and also be willing to cut them a little slack). I've had this one on my listen list. So glad to hear it's as good as I'm hoping.